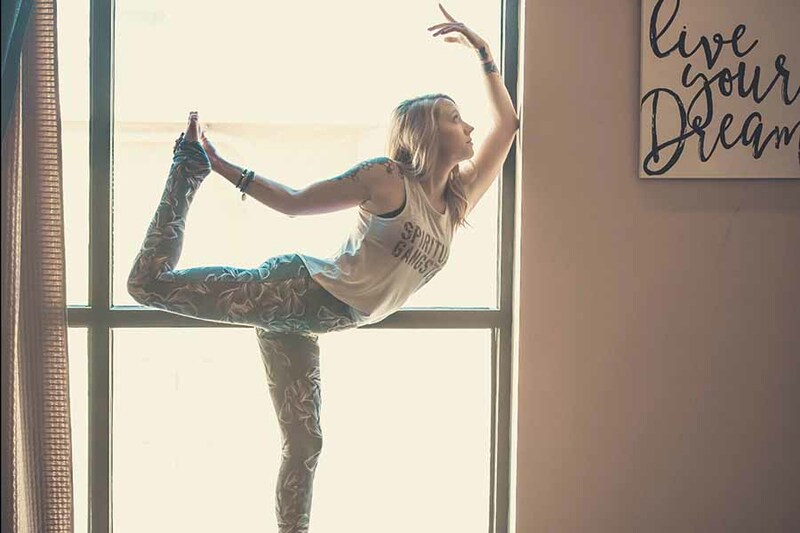 Prescott yoga instructor Katie Chatham says yoga has truly transformed her life. At a time when she was struggling and nothing brought her peace, yoga was her only refuge. And because it was so healing during her journey to transformation, she felt the call to become an instructor. Katie spent her entire life trying to figure out who she really was. During her high school years, she found herself mimicking the style and interests of her close friends. For a time, her identity was rooted in punk rock—black nail polish, dark makeup, checker-print everything. Then it shifted to an interest in gymnastics. As the years passed, her friendships grew distant and Katie found herself searching yet again for who she wanted to be. Her college years began, and she bounced between the party scene and the church world, never quite landing in one arena or the other. A few years after completing her degree at Northern Arizona University, Katie moved back to Prescott. For a time, it looked from the outside like she had life by the reins. In reality, though, she was still hiding behind that false front. She began to choose some self-destructive habits. She’d experienced some traumas, and as a result her drinking days from college carried over into her adult life. Alcoholic habits and tendencies began to surface as she tried to drown out the memories of those traumas. After a time, Katie moved back to Flagstaff in a vain attempt to fix what was beginning to feel broken in her life. After several life-changing, and what felt like very messy events occurred in Katie’s life, she began a lot of therapy, sought mentors, and as fate—or perhaps divine intervention—would have it, she found yoga. “I went to as many hot vinyasa classes as I could because I was also finding therapy on my mat,” she said. At the end of each practice session, she could see in the sweat pools on the mat the release of her stress, trauma, and pent-up “stuff.” In yoga, the mind-body connection is one of the fundamental pieces of any practice. So for Katie, beginning to connect with those areas where trauma, stress, sadness, anger, fear, joy, happiness, love, and more were pent up or trapped in her body, was the beginning of a process of healing and letting go. This healing began for Katie on her mat in yoga classes and has led her to becoming an instructor. She has since returned to Prescott and has made it her home. Today, drinking and alcohol no longer have a place in her life and she no longer feels the need to escape from hardship. She is on her mat practicing or teaching yoga every day. “I am beginning to love and accept the human I was created to be and to let go of any desire to be something I’m not. I actually like myself today!” she said. Yoga has played a huge role in allowing her to feel a part of something, a sense of belonging, and acceptance of her journey. She feels that she has gained a sense of self and hope for who she will continue to become. For class times and locations, follow Katie on Facebook at www.facebook.com/ktmariec89 or Instagram @ktmariec, or visit www.intentionsstudiopr.wixsite.com/yoga.